Homepage - D & JC Savage Haulage - transportation of general and refrigerated goods. Frustrated with your current service provider? Don’t get angry, get Savage! Welcome to the web site of Savage Haulage Ltd based in Cambridgeshire, UK. 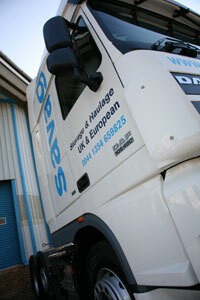 We specialise in the transportation of general and refrigerated goods as well as offering cold storage facilities. Savage Haulage has been trading since 1958 covering the UK and Europe on a daily basis. Managed by a team of professionals with many years combined Refrigeration experience we employ the very latest information technology, which constantly monitors the progress of your goods. Our continued investment in information technology, staff training and equipment allows us to supply you the customer with a total haulage system. "Whatever your haulage requirements, we're here to help..."
Our modern custom designed fleet caters for all types of products from full temperature control to ambient and general goods. Our vehicles are fully equipped with air suspension, the latest environmentally friendly cooling units and 24 hour tracking. We are able to offer vehicles from 500kgs up to 44 tonnes allowing you greater flexibility. A member of the management team is available 24 hours a day, 365 days a year, giving you the customer direct contact with a member of the Savage staff. Savage Haulage have recently been approved for BRC Warehousing and Distribution Accreditation.